Nomanslanding, Tramway, Glasgow. Photo: McAteer Photograph. Sitting against the curve of the white walls, you can hear the whispers in your skeleton and the ground starts to shake. A crack growing in the wall, a bright light, the surface shifting beneath you, and the world divides, cleaves, splits. A gap stretches out between you and your neighbour and the bright light gives way to darkness, an absence and distance that grows. At the limits, at an edge, it halts, rests and the world re-joins, covers over, heals. Your neighbour comes closer, the bright light flashes and the ground stops shaking. The ground stops shaking. You can hear the whispers in your skeleton, sitting against the curve of the white walls. You exit from a world that feels very different to the one you first entered. Co-commissioned by Glasgow Life and the Merchant City Festival, Sydney Harbour Foreshaw Authority and Urbane Keniste Ruhr, and bringing together artists from Australia, the Netherlands and Scotland, Nomanslanding is a big piece of work. The size of the sculpture, a large white-sided dome that rips itself in two encased within a wooden cage, is gloriously overwhelming and truly spectacular. Yet, where the work leaves its largest impact is in its attempts to reach beyond itself. This scale of intent is evident at all levels – through its creation as a collaboration across borders, through its implementation as a a site-specific work that can be re-sited, and through its performance, which draws connections between experiences of the First World War and experiences of the ongoing refugee crisis. Previously staged on the waters of Sydney’s Darling Harbour and Duisberg Ruhrort, Glasgow’s iteration of Nomanslanding was originally intended to take place on the river Clyde rather than the main space at Tramway (a shift made for engineering related reasons, I believe). Having not seen the work in its previous form, it is difficult to speculate on what might have changed as a result of that transition but what remains is an experience that, for all its size and splendour, still feels quite delicate. At its heart sits a quite striking image of how fragile communities, relationships, and the ties between people and places really are. When the dome separates we glimpse something, both what lies below the surface and what sits waiting to emerge within the gaps. This quality, a material that is both the foundation of our common ground and the very thing that separates, divides and distances us from one another, is something that both the waters of Darling Harbour and the darkness of Tramway 1 might perhaps embody in similar ways. Nomanslanding is a performance, yet its theatrical elements are pitched at the right level, being subtle enough and sparse enough so as to not dominate the feeling of being within this architecture, the experience of the wider work performing. 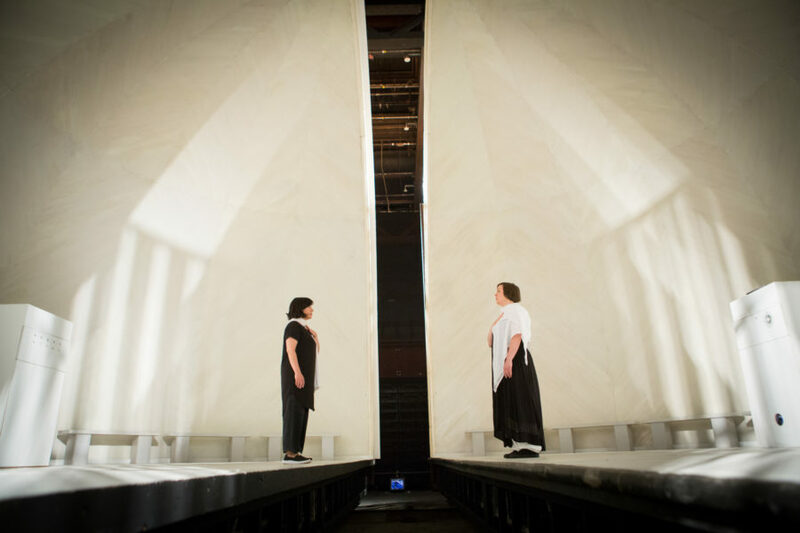 Within the dome, performers Nera Bello and Judith Williams shift between speaking, singing and whispering words that I can’t quite remember now – and I’m not sure I’m meant to. What I remember is the sound of the echoes, of the vibrations carrying through the walls of the dome – a sense of people attempting to communicate, attempting to get the message through. It is a beautiful noise, both quiet and urgent all at once. What’s more, the acoustics that serve to make the language so difficult to grasp permit me to relax into a space best described as meditative; it’s a great place to think and to feel. The work closes with a lament, a mournful song of grief. This moment, an acknowledgement of what’s gone, what was lost and what has changed, is oddly comforting. Reaching into history and layering it through the present, Nomanslanding demonstrates that worlds have broken apart before and worlds have come together again. It is a strange sort of hope, but it is hopeful nonetheless. Nomanslanding is at Tramway, Glasgow, until July 2nd. For more details, click here.